The oven in our house was terrible. Awful. So we bought a new one - a Kenmore Dual-Fuel. We love it. But there’s one thing that still trips me up about the control panel to this very day, 3 years later: setting the timer. This is the panel just to the right of the LCD. In order to set the timer, here’s what I usually do. Press SET in the Timer area. Enter a time using the hour/minute controls. SET! Again! There are two very simple reasons why I always turn to START. First, it makes sense to me. I set a timer to indicate the length of time for it; then I start the timer. Second, the START (and STOP/CLEAR) buttons are the only two on the panel with any color. Green. Start. It stands out. Coincidentally my microwave works this way. Even though there’s just one start button, when one is in timer mode it will in fact start the timer. 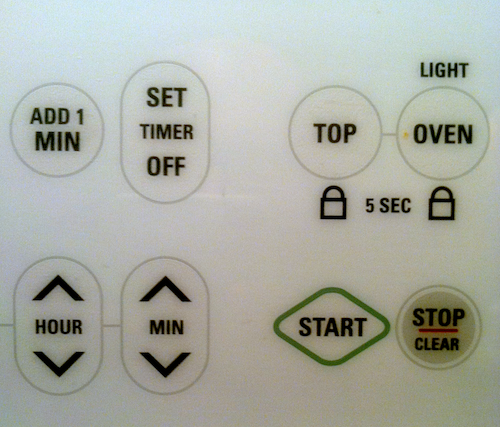 START and STOP/CLEAR are specifically for the oven and nothing else. This makes sense conceptually of course, and to be fair, they are far from the timer’s buttons. But at least for me, this could be resolved with a straightforward textual change. Make the SET button the SET/START button. That way, both of the functions are exposed to the user. They’re both still within the timer area, too, so the association becomes clearer. In the meantime, I’ll continue to occasionally botch this.